Matt and I have made the mini trip to Delaware for a couple days to see one of my sisters graduate from high school. Last night instead of our usual mandatory dinner at Dogfish Head we went to The Cultured Pearl. 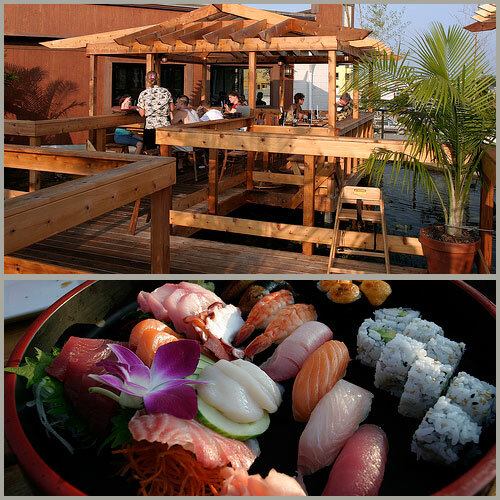 Located right on Rehoboth Avenue, this place has great food and an amazing atmosphere. There are little Koi ponds throughout the indoor seating area, but the kicker is the roof. The roof has clusters of little pagodas of tables that are all floating over a Koi pond. It felt so tranquil with the amazing view of the beach area, the water ripples and the amazing breeze. If you are ever in the area, you have to check it out! Photos by Kaszeta. No Responses to "BEST SUSHI at the beach"